What a glorious day!! The ad hoc group of Urban Sketchers met at the Japanese Garden today. Oh my! there was so much that "looked good!" - how to choose. Rather than walk around, I stopped at the very first scene that caught my eye. Soon, I was joined on the bench by the other Peggy, and so we sat, lost at times in our respective sketches, occasionally sharing a comment. Two hours later, it was time to gather!! And such wonderful sketches were shared!! 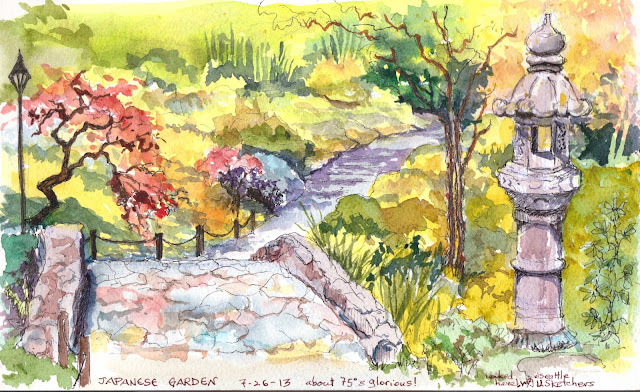 Your lighthouse and Japanese Garden sketches are all gorgeous, Peggy! This is very beautiful. Exquisite color and handling of the paint.